Sorry folks, but there are no POTW choices today. I'm away from home for a few days and I haven't been blog visiting much this past week. I'll try to get back on track for next week but in the meantime, here are a few shadowy images to hold my spot until tomorrow's scheduled post. 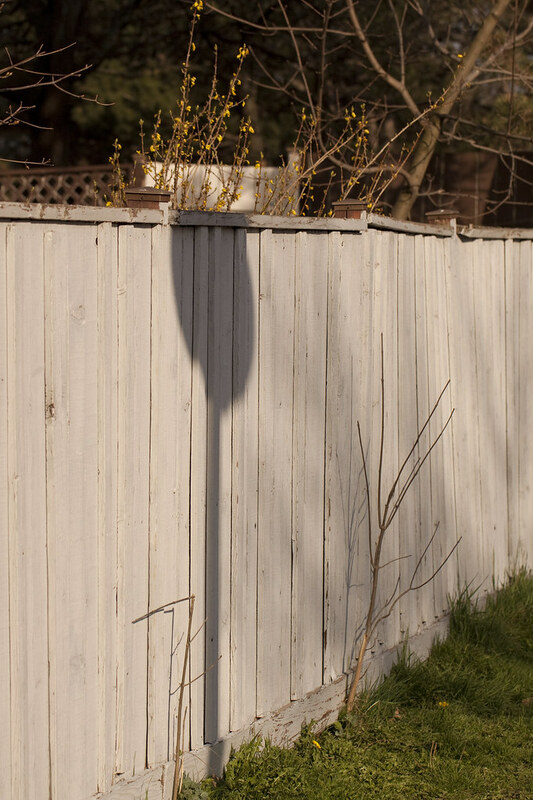 The shadow of a traffic sign caught my eye one day while walking with my friend, Carol Anne. A neighbour saw me stop to snap the shot and wondered what I saw. Just a shadow - but for whatever reason, I liked it. 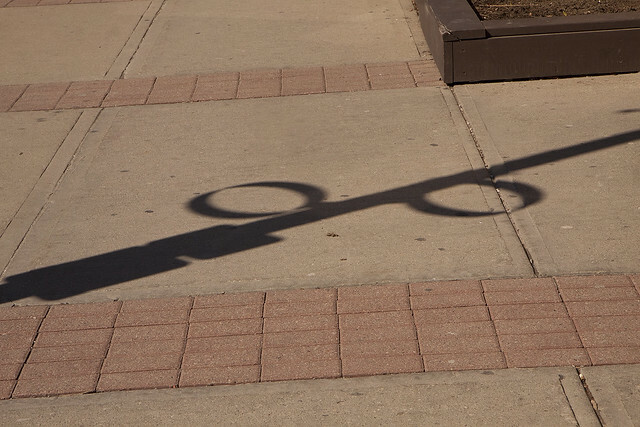 This is a shadow of a street lamp in the community of Streetsville. The circles are flower pot holders but this was in early March and none had been placed in them yet. This one was spotted from across the creek. It looks like a stick man to me. A very "You Fill in the Blank" stick man. It does look like a human figure. Very observant of you. Walking stick man! Very interesting what shadows can do. That last shot is interesting! Enjoy your time away. The fence and stick man, it's damn cute. 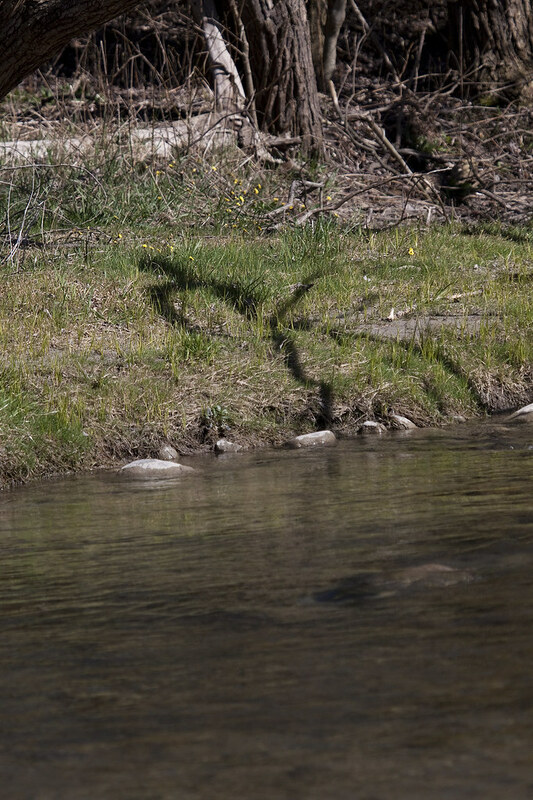 is that stickman irrigating the stream? Ahem... yes, what IS that stick man doing?? Women around the world want to know. yup, you got that last one right. Love your shadows! I am cheering we are finally starting to see green up north. Enjoy this away time. Seems to me the ladies are smitten with the stick-man. Who knew that a stick-man could elevate such a reaction. Funny, I wrote about shadows too today. What serendipity! Never noticed the sign it the first shot. Pretty tricky! Last one? What are the yellow flowers behind the stick man? Good evening ! How are you ? The images are wonderful . Love your shadow shots. I'm not filling in THAT blank. Like the shadows, hope you are havig a restful break. Love the lamp post shadow with the circles, and I think your stick man is peeing in the creek! Your shadows are awesome. The last one... I thought this was a family friendly walk along the creek!